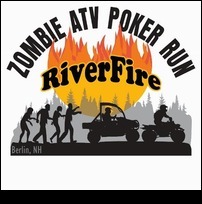 "NEW" this year.... ZOMBIE ATV POKER RUN @ RiverFire Berlin NH. OK...so the BIG question of the day is..."What are the Poker Run stops?" The BIG answer is: "It's 32 miles of adventure from Gorham to Berlin to the trails of Jericho Mountain and then you end up at the HOTTEST event of the season....RIVERFIRE!" DID YOU MAKE YOUR PLANS YET?? I'm in, never been to a Riverfire event but looks like fun. What better way than on my machine.